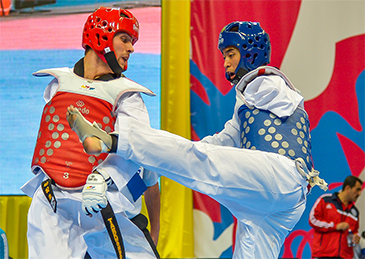 MOSCOW, Russia (June 22, 2014) — Host Russia won the overall men's title at the 5th WTF World Para-Taekwondo Championships in Moscow, Russia on 22 June, 2014. Turkey took the overall women's title. Host Russia took three gold medals, three silver medals and four bronze medals for a total of 71 points for the top honors, followed by Iran with 2 golds and 1 silver for a total of 31 points. Turkey came next with two golds and one bronze for 31 points. Azerbaijan finished fourth with one gold and one bronze for 28 points, followed by Mongolia with one gold and one silver for 21 points. In the women's division, Turkey grabbed two golds and two bronzes for a total of 23 points for the overall women's title. Host Russia came next with one gold, three silvers and one bronze for a total of 23 points. Ukraine stood at third with one gold and one bronze for a total of 12 points, followed by Denmark with one gold for 11 points and Great Britain with one gold for 10 points. In the male division, the Good Fighting Spirit Award went to Morocco, while Guatemala took the Active Participation Award. In the female division, Lesotho won the Good Fighting Spirit Award, while Colombia won the Active Participation Award. Ukraine's Viktorria Marchuk, who won the gold in the female K43 -49kg category to become a three-time champion, was selected as the female MVP of the Moscow championships. Mongolia's Bolor-Erdene Ganbat, the winner at the male K44 -61kg division, was chosen as the male MVP. Australia's Maher Mgableh, Morocco's Tarik Benradi and Jordan's Ms. Haya Qubain-Kara were selected as best referees of the championships. Russia's Efremov Alexander was chosen as the male team's best coach and Turkey's Zehra Orkan was named as the female team's best coach. A total of 111 athletes from a record 37 countries participated in the two-day Moscow championships. The event, which took place at the Dinamo Sport Palace in Moscow, featured both kyorugi and poomsae competitions. A Daedo protector and scoring system (PSS) and an instant video system were used.